Looking for great apps at a fraction of their regular cost? 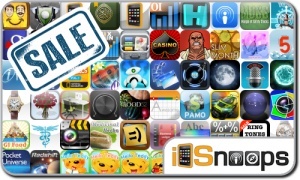 We’ve found 65 iPhone, iPad and iPod touch apps that are currently on sale. This app deal alert includes Tactical Soldier, iDaTank, Casino, Fairy Cubes, Glow Worm, iCruciPuzzle, Car Club: Tuning Storm, Food52 Holiday Recipe & Survival Guide, Color Range, Movie360, and many others.